The midi you are listening to is a tradional tune called, 'The Nightingales Sing', also known as 'The Grenadier and the Lady'. You are looking at the Cannon Street Railway Bridge across the River Thames. 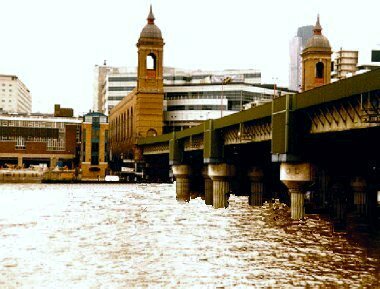 This bridge, also called, Alexandra Bridge, carries trains into Cannon Street Station. It was built in the 1860's and widened in the 1890's.